The saying goes that you can’t step in the same river twice, and for barrier islands along the coast of Virginia, the same is true. Barrier islands are sandy dune systems that stand between coastal lagoons and the ocean. In Virginia, barrier islands extend along the Eastern Shore—and some are moving. Cedar Island has been migrating back toward the mainland at an average rate of almost 20 feet per year over the last 30 years. On the other hand, Parramore Island has gone through periods of growth and shrinkage but remained in the same location for the last 1,000 years. Christopher Hein, an assistant professor at the Virginia Institute of Marine Science (VIMS), says marshes show evidence of the islands’ migration toward the Delmarva shore. Marshes form between the barrier islands and the mainland. As water pushes the barrier island sands toward the mainland, the sand moves on top of the marsh behind the island. Eventually, the whole island ends up behind the marsh, and the marsh faces the open sea, where rough waves destroy it. The loss of these marshes to erosion means a loss of habitat for seagrass, bay scallops, and the calm waters that serve as a refuge for spawning fish. The marshes also pull carbon out of the atmosphere and store it in the sediment. To understand why some barrier islands are moving landward faster than others, researchers look at the island’s history, preserved beneath the sandy dunes through the geologic record. 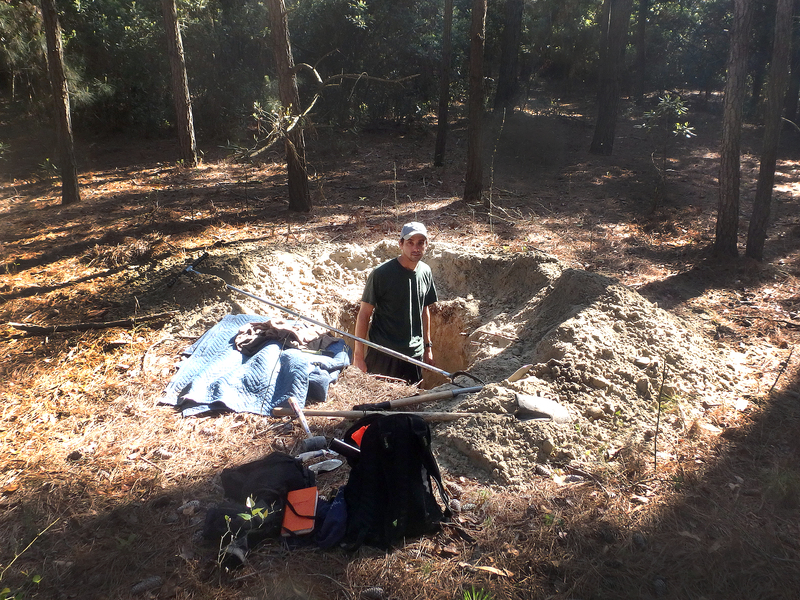 Hein studies the geologic clues that tell why some barrier islands are moving toward shore in his current Virginia Sea Grant-sponsored research. Hein and his team collect sediment as deep as 30 feet beneath the surface. These sediments record conditions over the last 5,000 years, which roughly covers the entire histories of the islands. Barrier islands are sandy dune systems that stand between coastal lagoons and the ocean. In Virginia, barrier islands extend along the Eastern Shore—and some are moving. 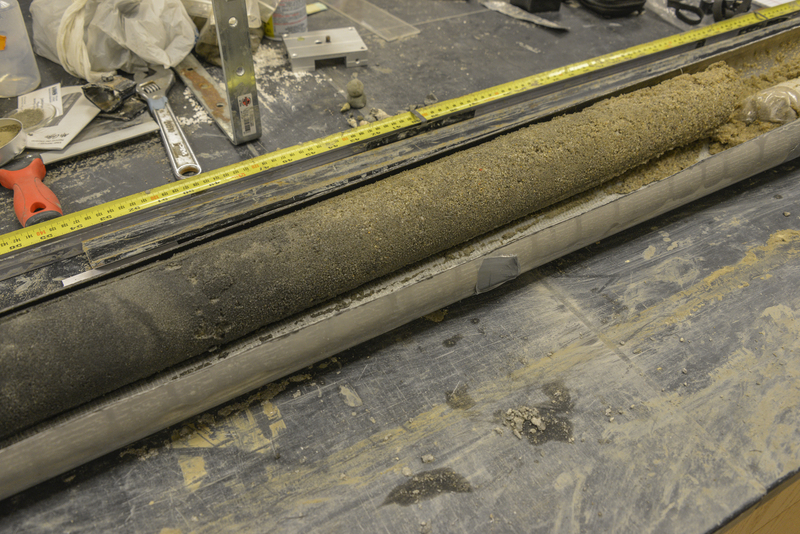 These deep cores show that some stable islands like Parramore are anchored in place on top of even older barrier islands from approximately 80,000 years ago. When ancient sea levels rose and covered the older islands, other islands (like Paramore) migrated over and onto the them and got stuck. Today’s rapidly moving islands like Cedar either moved over ancient barrier islands, or never had an older island to anchor it down in the first place. Even though studying islands that are thousands of years old may seem archaic, determining how barrier islands responded to past conditions is important to answer questions about how the islands might grow or shrink in the future. While studying the history of Parramore island, Hein and his team discovered that the island went through periods of time where it thinned and lost sand, and even broke up into a number of smaller islands. However, throughout this, it remained in the same place overall. For more information about the future of Virginia’s barrier islands, the processes that cause them to grow or migrate, and the decisions coastal policymakers face, read part two of this series about Justin Shawler’s research. Barrier islands along Virginia’s coast buffer the mainland from storms and provide a valuable marshy habitat that is threatened by erosion. Coastal geologists study the islands’ sediment layers to understand how the islands have changed over time. Understanding each island’s historical conditions help researchers understand the processes that shape the barrier islands and how they might change in the future. Hein and his team collect sediment as deep as 30 feet beneath the surface. These sediments record conditions over the last 5,000 years, which roughly covers the entire histories of the islands.